How to buy a Property without Home Loan? You are here >> Home >> Real Estate >> How to buy a Property without Home Loan? Buying a Property is quite tedious and cumbersome process in India. Normally its a big hassle to buy a property due to complex legal processes and absence of Real Estate Regulator. Besides this there is no centralized database of housing units in India and due to corruption large no of projects are in legal tangle. Though majority of property transactions are through Home Loan but considerable no of property transactions are executed without Home Loan. In my post on How to buy House with Home Loan i discussed steps relevant to property purchase by availing Home Loan. In this post, we will discuss how to buy property without Home Loan i.e. entire payment is being made by the buyer from own sources of fund. When a buyer is buying a property without Home Loan, Buyer has upper hand in the transaction. Reason being, transaction can be completed very fast and seller will get funds without much delay and hassle. The lead time for seller in Home Loan funded transaction is approx 45 – 60 days whereas without Home Loan, transaction can be completed within 10-14 days time. Buyer should take advantage of this situation and may demand discount on quoted price. Normally builders / sellers are willing to offer discount of upto 10% and in few cases upto 20% if buyer is pooling money from own sources. Typical example is revised 80:20 / 90:10 scheme of builders. It is also referred as Down-Payment Plan. If a buyer is willing to pay 80%-90% funds upfront then builder is willing to offer discount of upto 10%-15% on property. Reason being, builder will get cheap funds. If he borrow from market, he will pay interest of upto 24%. Secondly builder is hedging his risk as he is recovering entire cost which is approx 70% of quoted price and booking 10% profit upfront. He can afford to offer 10% discount and balance 10% can be recovered at the time of possession. In case of resale, seller prefer buyers who can pay upfront in single installment without going into hassle of Home Loan. It is always advisable for buyer not to disclose his cards on negotiation table. Best way to negotiate is to finalize the price and then ask for 10%-15% discount for upfront payment i.e. to close property transaction without Home Loan. Property transaction without Home Loan is High Risk Transaction. Reason being, when buyer avail Home Loan the legal verification is done by Home Loan provider before Home Loan is sanctioned. In case buyer is paying from own sources then this imp step is skipped. Therefore it is absolutely necessary for buyer to obtain “Title Certificate” from local competent property lawyer. Also it is more safe to buy property on which Home Loan was availed in past. Normally lawyer complete legal verification within week’s time therefore buyer should not be in a hurry to close the property transaction. Secondly, Buyer may ask for all important documents like List of original documents with Seller, Encumbrance Certificate, NOC & No Due Certificate from society, latest Khata Certificate, Property Tax Receipt, Copy of Electricity Bill, Copy of NOC from bank if property was mortgaged in past etc. Many buyers make a mistake of directly executing Sale Deed. It is important to sign a Sale Agreement and list down terms and conditions of property transaction. Token amount, max equivalent to 10% of transaction value can be paid to the seller. Time-line for closure of transaction can be 14-21 days time which include 7 days buffer. The Sale agreement can be Notarized. The seller should keep all the documents (as listed in previous section of this post) ready for legal verification at the time of execution of sale agreement to save time. One of the imp clause in sale agreement should be that closure of transaction is subject to clear “Title Certificate” from lawyer. After following above mentioned steps, Sale Deed can be executed and buyer can pay balance amount to the seller at the time of execution of sale deed. 1. Home Loan of a Seller: If you are buying a property which is currently on Home Loan then it is advisable to hold 10% payment till Home Loan Provider of seller release & hand over all the original documents to buyer and issue NOC. Reason being, Home Loan is closed on date of sale deed and bank will take 2-3 weeks to release all original documents and issue NOC. A clause related to this can be included in sale deed. 2. Under construction property from Builder: If you are paying 80%-90% amount upfront from your pocket and buying a property from builder under 80:20 / 90:10 scheme then Risk of delay is high therefore insist on unconditional stringent compensation clause in case of delay. Secondly, it is not advisable to buy property during Pre-Launch period when project approvals are not in place though discounts offered are high. You will be risking your capital. 3. 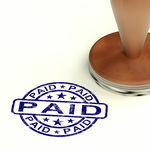 Payment through Cheque / DD: Payment to builder / seller should only be through DD or Bankers Cheque. I never suggest or recommend any CASH dealing in property transaction. You will be risking your money. 4. TDS: Last but not the least, if you are buying a property from own sources of fund then don’t forget to deduct 1% TDS if seller is Resident Indian or 20% TDS if seller is NRI. Each property transaction is different and above mentioned guidelines are general in nature. One shoe doesn’t fit all therefore thorough home work and research is required before a buyer sign below dotted line. Moreover its your hard earned money and you will not mind a delay of few days or spending few thousand rupees more to buy peace of mind.